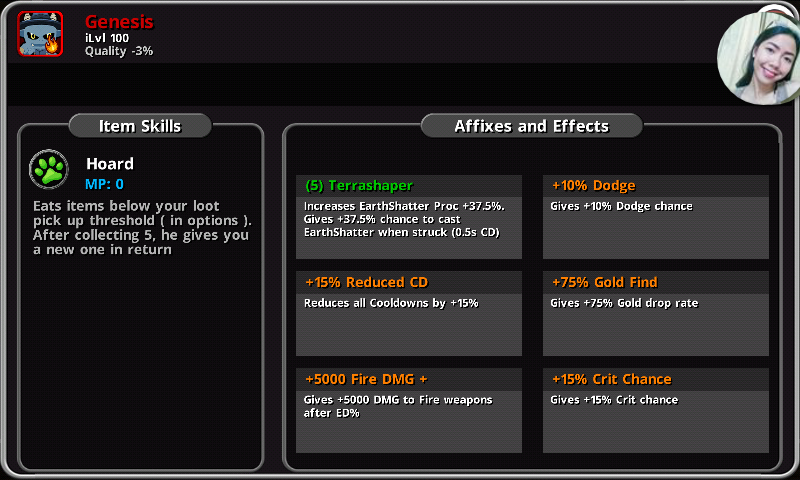 Hi guys, i need some help, I was really planning to create a farming build with all the farming set affix such as eternalized,crystallized, nadroji and epiphany for maximizing luck cap and gold find cap. The issue here is that I easily get killed and it would cost me a lot of money to revive again and again. What’s lacking with my build in terms of crushing flames? Or does this build good with crushing flames? Or electrocution, frozen or plagued? Does the 7× +5000 elemental damage good? Do I need to replace the other +225 luck to +45 cooldown reduction to spam tornados more? Crystal Block +45% on OH will help your defense a lot. 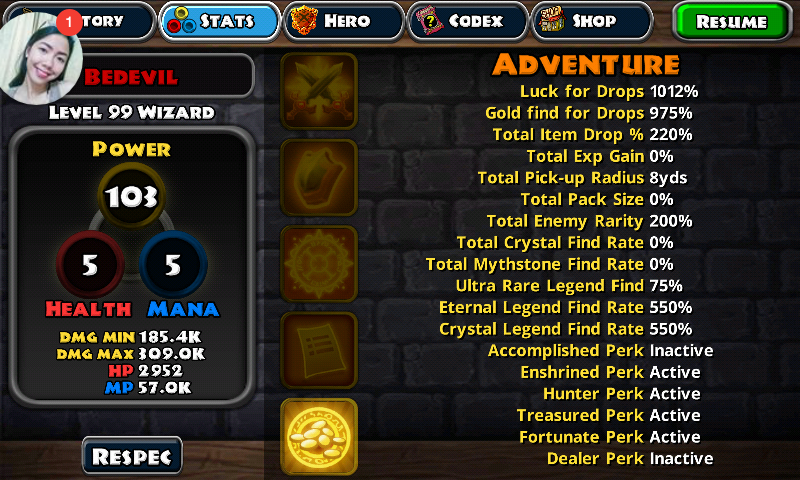 and you only need 1 Crystal Luck & Gold Find. if you are on Mythic 3 Difficulty, you only need to get +300% on your items for Gold Find & Luck to get +650%, +850% with Fortunate Perk (you have ), and +1012% with Epiphany (5)(which you also have ). for Gold Find & Luck, if you keep 3x Greed Natures, change the other 3 to Luck. this way you can get rid of the Gold Find on your Pet. or if you keep your Natures the same, change the Gold Find on the Pet to Luck instead. 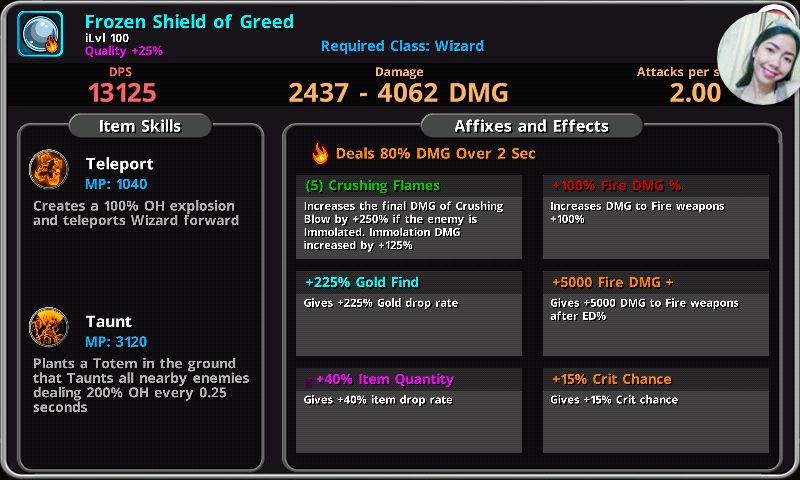 1x Epic Crit Chance and Crit DMG instead of 2x 5000 Fire DMG. more Critical Hits for even more Critical DMG!!! since you have Taunt, change Twister on your Gauntlet to Storm, it is a better combination. especially with Crushing Flames. Twister goes away from the monsters you Taunted, and Storm does more DMG and has a higher Attack Frequency when you put Hero Points into them. add 2x Epic Storm instead of 2x 5000 Fire DMG. Storm 40 is 8 attacks a second for 5 seconds. Twister 40 is 5.6 attacks a second for 2 seconds. Twister needs lots of Cool Down to really be useful, but Storm only needs enough Cool Down to be used every 5 seconds, which is how long the Spell lasts. 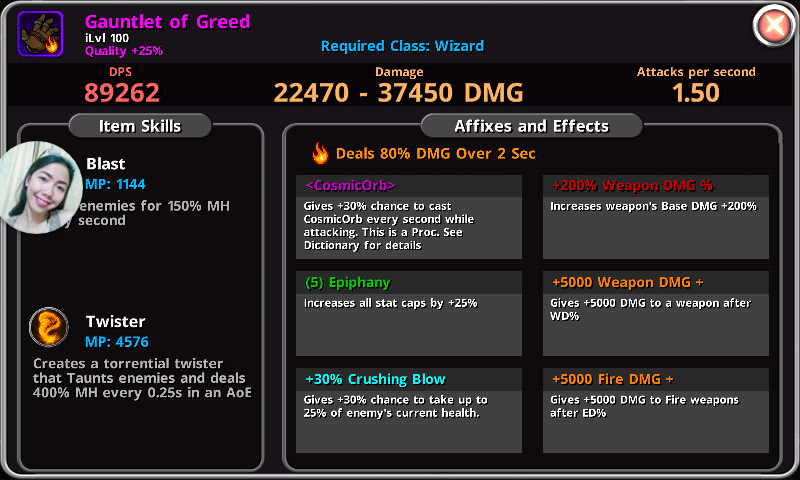 with 3x 5000 Fire DMG left, change one to 1x Crushing Blow and the others to 2x Crit DMG (with your Epiphany (5) and the Crit DMG you added earlier, your Crit DMG is now +438% instead of the +225% you have now). I know you are thinking I am crazy making you take off 7x 5000 Fire DMG, but with the 2x Storm, more Crit Chance & DMG, and a little more chance for Crushing Blow to improve the DMG of Crushing Flames, you are actually doing a lot more DMG, and the Crystal Block will help you with survival. I don’t know if this will help, but change Amplify Talent to Sorcery. with Legend +30% Elemental Crit, you now have +50% Immolate for your Skills, which means more chance for Crushing Flames to work. all of the other changes that increased DMG might make it easier to change Amplify to Sorcery. I used a Storm & Taunt Build while Ascending for Perks, and for farming for awhile, so I know that it works good. I didn’t have so many Farm Sets, which is why you need other ways to make DMG. I hope this helps make farming easier and more fun. Edit: I just did some calculations. although taking off all seven 5k Fire lowers your Normal DMG, you are doing more DMG with Crits. and improving your Crit Chance from 45% to 55% also means more Critical Hits. I used a pretend weapon that does 10k dmg, and used +200% WD, 5k WD, +200% ED, +35k ED, x4 (for Twister DMG), +100% Twister (20 Points in Twister), +50% crit hit dmg, +225% Crit DMG. this is a similar to what your Build has right now. a crit hit with this came out to 5,460,000 DMG. with my changes, it is a 10k Weapon using +200% WD, +5k WD, +200% ED, x4 (for Twister DMG), +200% Twister (40 Points in Twister), +50% crit hit dmg, +438% Crit DMG. a crit hit with this came out to 10,168,200 DMG. umm, Storm does x6, so the DMG in the end would be even higher. 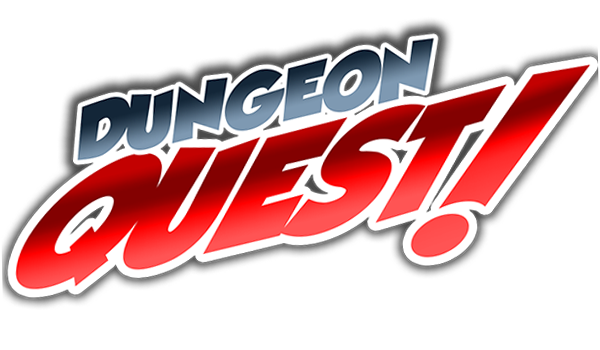 (in Mid’s DMG Guide, the base +50% Crit DMG is added to any other Crit DMG, so the +50% & +225% would be +275% for the first and +50% & +438% would be +488% for the second. the new numbers are 4,200,000 DMG & 7,408,800 DMG Crit DMG. even though lower, the second Build still does more DMG. my head is starting to spin). DMG from Crits will totally make up for loss of Normal DMG without the 7x 5k Fire DMG. I was just wondering if the changes really made a difference, so I took a look with a calculator! these calculations also didn’t include Power Stat, Glasscannon, or Amplify. or Energy? also, attacks do +/- 25% for a DMG range. like 75-125 DMG for a weapon that does 100 DMG. Thats actually nice, never thought of using storm though haha. Anyways one question though? Can I change my luck in amulet rather than in my orb? Or 45% block rate is only rolled in OH weapons? And btw can i keep my dodge too? Anyways, can i ask? What floor will drop more ultra rare crystals? keep Dodge. Dodge & Block work together. when you don’t Dodge, you still have a chance to Block, and vice versa. and when neither work, you have Sanctuary. and yes, Block can only be rolled on OH. 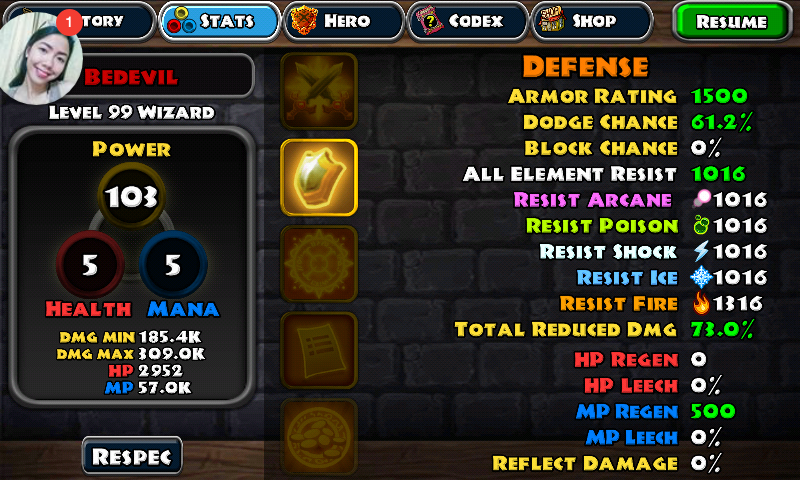 there are some other Warrior items that have Block, except for Neck item, but that would kind of mess up your Build. unless you can find some Warrior MH with Block & WD% to Jasper to Wizard Gauntlet. for the Crystal Luck & Gold Find, redo your OH to have Block, and redo your Ring to have Gold Find, that way you don’t have to worry about getting Sanctuary again on the Amulet. floor 500-510 is best for farming Ultra Rare Crystals & Myth Stones on any Difficulty Level. but you don’t get the 5 lowest Crystals & Myth Stones. at every 100 floor up to 500, you lose the ability to farm a lower Crystals. so 100 is no Calcite, 200 is no Angelite, and so on up to 500. and the higher CS/MS become easier to farm. as @brang said, you can also sell Eternal & Crystal items for Ultra Rare, at 500k Gold each, and Legend items for Rare, with a chance for Ultra Rare at 245k Gold each. so that means lots of Gold!!! Thanks to you both, Ive been planning to change the OH with block soon and also the amulet, reason for amulet is to save my +2 set numbers from elixir on my ring, this mythstone is hard to find and i only have 1 zenith and 1 master. But got plenty return for the sanctuary. Anyways when farming do you really need to specify a pack size? So more mobs more drops? Or its just the same in one map? Cause in planning to go to floor 200-210 and then 500-510 and vice versa to maintain larimars and diamonds to reroll some pack size (at least 120+), ive been rerolling maps though for pack size and it seems to give me an average of 3-5 legends, sometimes in one run 2 eternal + 1 crystal legends. Btw I just noticed that you edited your post at the top, your suggestion did pretty well, in f500+ I can easily kill mobs even legend enemies with just one storm, my damage output dealt is big yet fast, like you said +20 epic storm increases more of its frequency and elem. Crit where crushing blow comes to place. It really did help and it gave me some more evasion because of the knock back. I was even planning to get crystal 45% cd reduction rather than block since I only die 0-3 times in a map but I dont know if its worth it though since producing more storms dont stack, what would you suggest? How about deadly strike? Or I dont know, Im testing it for now. And for now it seems pretty good. Thanks for your advice. pack size is good for experience if getting Perks, or for loot drops. the more monsters from Pack Size speeds up the Monster Feats rewards and the Loot Drop rewards. Pack Size & Nadroji Bonus gets the Mythic Monster Feat even faster to get the Eternal Item Reward more often. as for the Edit:, I mostly wanted to see what the difference would be with the changes and then share them. when I had Taunt on OH & Storm on my Staff, OH was Ice so when Taunted, they would get hit by Freeze, and then hammered with Storm with Fire & Crushing Flames. when Freezed, they don’t get knocked back and get really hammered by Storm, and if they don’t get Freezed, they get knocked back away from you. Storm is 4 hits a second. Storm 20 is 6 hits a second. Storm 40 is 8 hits a second. so it really adds up. and Storm last 5 seconds, which is why having enough Cool Down for Storm to be used about every 5 seconds is good. having to wait 1-3 seconds to use Storm again when you really need it, and for Taunt also, can be bad for your health. putting points in Storm also gives a bonus to Elemental Crit Chance. So pack size does give you a more chance of crystal/ eternal legend drop for conversion, and btw? What would you suggest rather than block? Since a 45% cd reduction is useless when using storm? Pack Size Map: not so much a better chance than more chances. if a monster has a 1% chance to drop an Eternal Item (I made up the 1%) and the Map spawns a Pack of 5, you have 5 chances of 1% each. a Pack Size +100% map would increase that Pack of 5 to 10, so now you have 10 monsters with a 1% chance each to drop an Eternal item. Cool Down & Storm: Storm lasts 5 seconds, but has a terrible Cool Down of 7 or 8 seconds. you can’t cast multiple Storms like you can with Twister. but lets say you cast Storm, get in trouble and Teleport away, and end up in a Pack of monsters that want to put your head on their locker room wall. if you are in a small area, Storm would be great, but if you still have 3 seconds to go to use it again, good luck. but if it already cooled down, you can cast it again, even if it still has time left on the other casting. you don’t care about the trouble you left behind, you care about the trouble you just jumped into!! there have been lots of times I am glad I had improved CD for Storm, saved lots of Gold not having to revive a lot from dying. So I guess im getting a 45% cd reduction since my storm is around 5.6 sec cd and my taunt needs a cd reduction as well so I can use it more, my usual combo in every jumps is taunt storm so i wont get hit first by their attacks reducing its cd would result to a fast jumps and skill. Thanks again bro. I got another question though, if it is for my build what pet would be appropriate? I got 3 legend pets actually 2 slimes got the new one void with elements as set affix and 1 imp with terrashaper, im using terrashaper right now since elements I guess is not useful for storm. Another one is, if i copied ur build where i would change my oh with ice? Would it affect the fire damage of my storm? Since my oh has elem dam. % and I read the calculations about elemental damage % and it says that the more elem. Damage % would result to more low damage, meaning a 100% elemental damage is already enough, is this right or I have a wrong perception to it? well, the thing is, with Fire oh MH/Storm, you have the Hammer of Crushing Flames, at 8 attacks a second to lower enemy HP really fast, and Crushing Blow isn’t affected by ED or WD. you could make up the loss of +100% ED by adding 1x +100% Frostbiting somewhere, so that when you Freeze the monsters with OH, all attacks against those monsters do +100% DMG while Freeze lasts. or Ice MH & Fire OH, or just stick with Fire and maybe add 1x +100% Blistering. 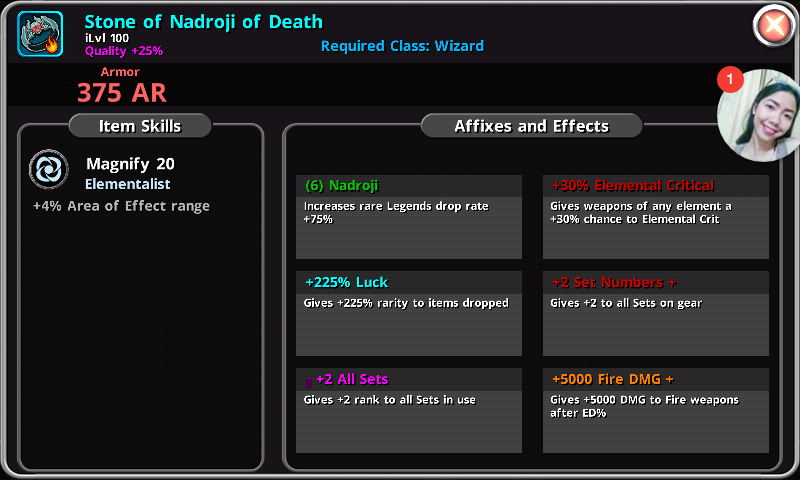 you have +200% Fire Ed, changing to 2 Elements would be +100% each for Fire & Ice (ED% on OH & Nadroji Robe). if you don’t have Earthshatter Skill or Proc, and don’t want to get hit, Terrashaper is a bad Set to have. better to just make an Epic Pet until you find a Legend Pet with a Set you can use. one more useful affix instead of a useless Set. or even better, take Terrashaper off and replace it with another Epic affix. this way, the Imp stays Legend and you only have to change/improve 1 affix. that calculation is about how damage is calculated using different damage boosts. the more of the same boost you use, like the difference between using 1 or 2 Glasscanon versus using 1 Glasscannon and 1 Barbarian. but ED affects the Weapon directly, before you use something like a Set or Glasscannon to boost DMG. the lower returns for using more than 1 ED% isn’t as bad as you might think. in my example above, WD & ED is figured first, Weapon Skill, Glasscannon, and Crit last. if you really want, change both ED% to Ice, so your Taunt keeps the +200% ED DMG, since Storm is mostly there to put the hurt of Crushing Flames on your foes. if you want to do +100% Fire & Ice, so that your Immolate still gets extra DMG, then go that way. the only reason for the Ice OH is to keep the Storms knockback from knocking enemies out of the range of Storms DMG. an enemy knocked out of the range of Storm isn’t getting damaged. or go Fire OH & Ice MH. the OH will Immolate, and you still have the Crushing Blow with Storm to take advantage of Crushing Flames. And also say if you had had 550% chance of dropping an eternal item then in game play it’s only 5.5%. So a 94.5% of dropping epic etc. Better than nothing. I’ll just ask here instead of making a separate thread. I’m a bit confused on the dual elements build concerning Crushing Flames. Most of the time, I see is they use Ice/Fire with Ice on MH and Fire on OH and vice versa. My question is, does immolate proc if your fire elem in on OH but you mainly use MH skill? Thanks so much. I actually survived more with ice oh though its a great help. 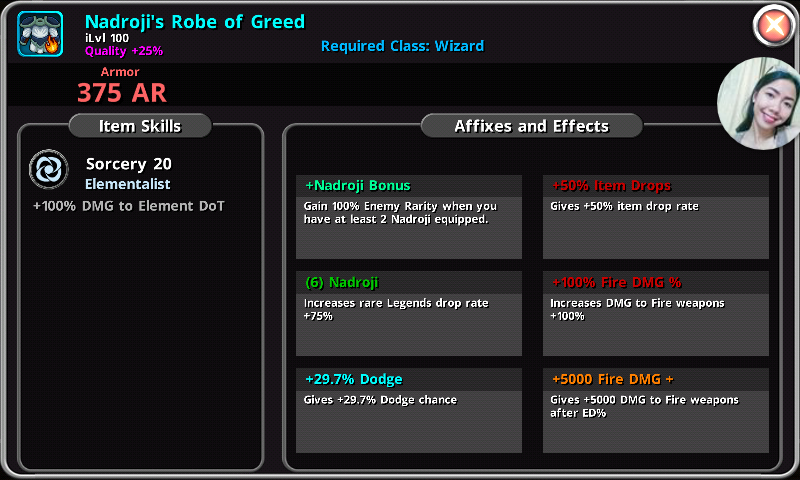 I was planning to change the nadroji robe, i dont think the bonus is that much of a help I guess? 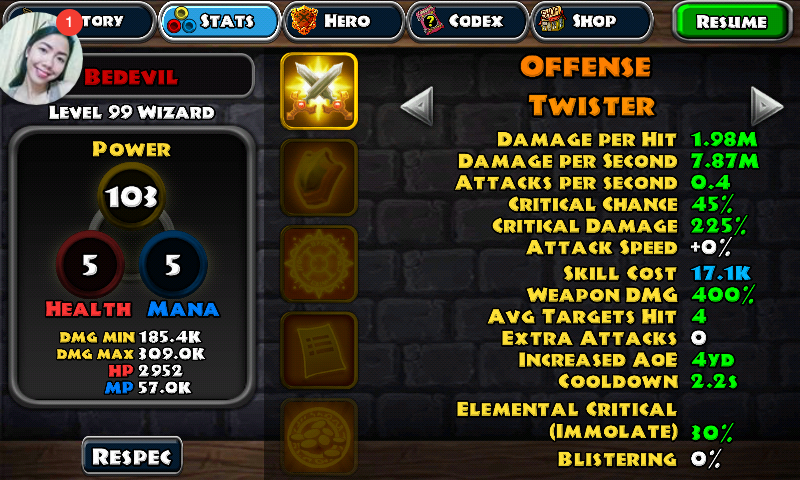 Didnt notice the changes, i was planning to get frozen so I could burst out more damage, just a little experiment. Yeah its better than nothing.